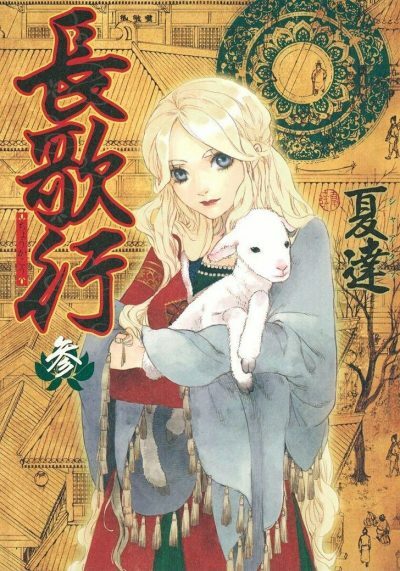 Choukakou, which is also known as Chang Ge Xing, Chang Ge’s Journey, or Song of the Long March, is an ongoing manhua (Chinese comic) series by Xia Da. Volume Three collects issues twelve through eighteen. Li Chang Ge is a wanted fugitive. Sun habitually distrusts women and he certainly does not need to be drawn into Chinese dynastic disputes. He has Turkish dynastic disputes to concern him. Sun is the adopted son of the Great Khan. He desires only to serve the Great Khan. The Lesser Khan, the Great Khan’s nephew, sees Sun as a potential rival, to be eliminated if possible. To that end, Sun and his army have been used to distract the Chinese. If Sun succeeds, he can expect little glory. If he fails, well, that’s one rival down. Sun explains these dynastic tensions to Li Chang Ge, who suggests that Sun request a transfer to the northern border with China. There he will present no obvious threat to the Lesser Khan. He may be able to sit out the ongoing power struggle at court. He may even be able to set up and profit from new trade routes. Once in the north, Sun makes a serendipitous discovery: the warrior Jiao Dan, who once saved Sun’s life as young boy, is not a Turk as Sun had assumed, but a Khitan, the very people from whom Sun is collecting tribute. Out of gratitude to the old warrior, Sun decides to allow the Khitan to participate in the new trade routes. Back in the Turkish court, the Lesser Khan convinces his uncle that Sun may have betrayed the Great Khan. The Great Khan proposes a simple test: order Sun to execute the Khitan for failing to pay their full tribute to the Great Khan. If Sun hesitates? The Great Khan’s representatives will kill Sun as well. I left out the part where the Princess so angers an old family friend he drops dead of apoplexy. Also the bit where it turns out that the Princess’s mother never explained menstruation to the Princess1. Sun may hold all women in contempt but it does not seem that this is an idiosyncrasy; every culture featured in this story sees women as weak and untrustworthy. Li Chang Ge can only defy those expectations by cross-dressing. In fact, Li Chang Ge herself tends to think of herself as not exactly a woman. Readers looking for stories where it turns out people living in another country long ago happen to embrace values like modern Western liberals might not enjoy this comic. The Eastern Turks have their own set of values, as do the Tang Chinese. The Princess is still working out what exactly she believes in. None of these characters or cultures are particularly nice by modern standards. Still, the art is still engaging and readers looking for high-stakes politicking, strategy, and the occasional blood-letting should enjoy this. Just don’t get too attached to any of Li Chang Ge’s allies. They’re ephemeral. As far as I can tell, there is no English edition of this available at the moment. 1: The Princess had a rather unconventional childhood that isolated her from the society of other women.